The Future in Sanitation is off the grid! How much water do each of us use every day? Can future sanitation systems and off-the-grid houses be designed so as to minimize energy and water consumption? Where does wastewater management fit into the waste hierarchy/pyramid? 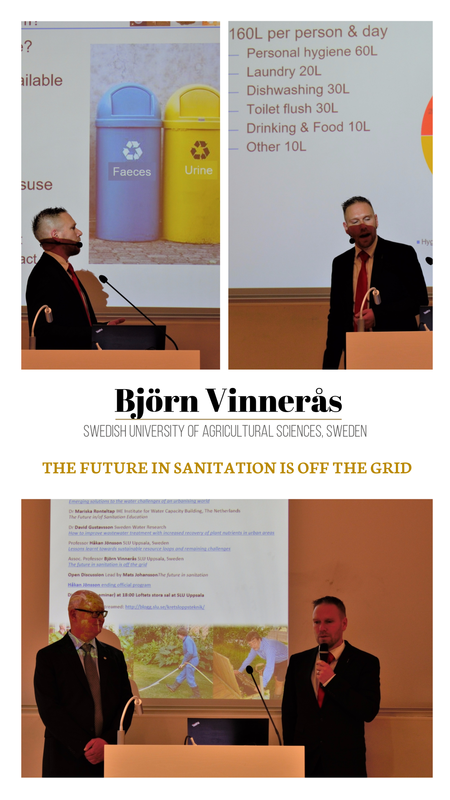 In his presentation, Björn Vinnerås, Associate Professor at SLU shares with us his vision of future housing: a future where there is ‘no need for network connections, neither electricity nor water, and nor wastewater’. Click here to access the presentation. Luis Fernando Perez Mercado, Doctoral Candidate at the Environmental Engineering Unit, Department of Energy and Technology will defend his licentiate thesis entitled, On-farm filtration technology for pathogen reduction: Reuse of low hygienic quality water for vegetable irrigation. Jenna Senecal, Doctoral Candidate at the Environmental Engineering Unit, Department of Energy and Technology will defend her licentiate thesis entitled, Urea stabilisation and dehydration for urine-diverting toilets: System and hygiene evaluation.